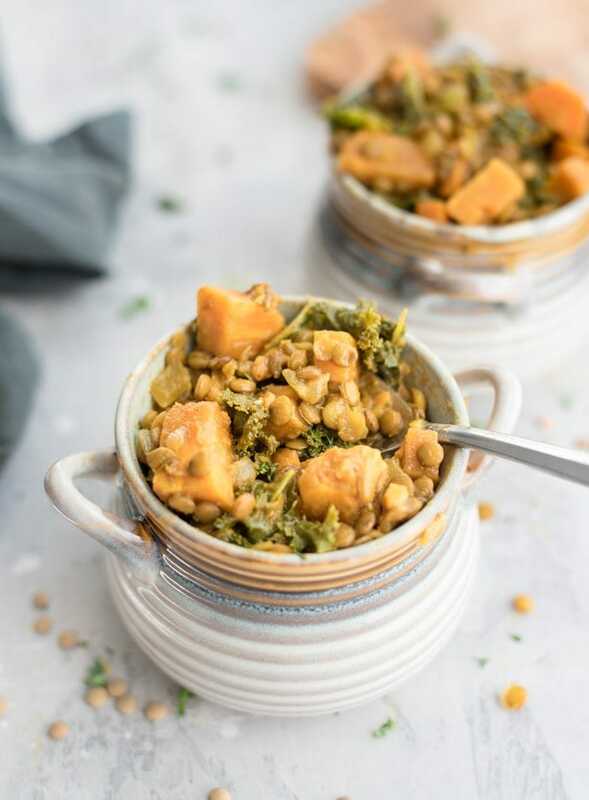 This hearty stew is full of nutrition thanks to the kale, sweet potato, lentils and other nutrient-dense ingredients. Let’s take a look at the health benefits of it’s three main ingredients. Sweet Potato. Sweet potato is an excellent source of carotenes and a good source of vitamin C and B6. They also contain manganese, copper, biotin, vitamin B2 and dietary fibre. 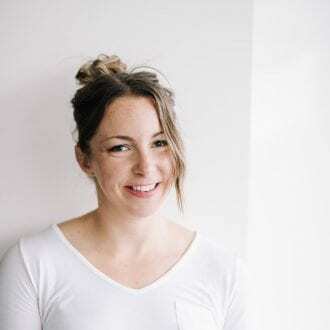 The root storage proteins they contains exert significant antioxidant effects, which along with their vitamin C and carotene content make them an excellent food for boosting disease-fighting antioxidants in the body. In addition, unlike other starchy vegetables, sweet potatoes are classified as an “antidiabetic” food. Studies have shown that sweet potatoes actually help stabilize blood sugar levels and improve the response to. the hormone insulin. Kale. Kale is one of the most nutritious vegetables you can eat. Like sweet potatoes, it’s an excellent source of carotenes, vitamin B6 and vitamin C. It’s also a good source of fibre, copper, iron, vitamin E and calcium. Kale is a member of the cabbage family, exhibiting the same anticancer properties that collards and other greens in thiscategory do and it’s also extremely high in chlorophyll and the carotenes, beta-carotene, leutein and zeaxanthin. Hello, healthy, skin, bones and eyes! Lentils. 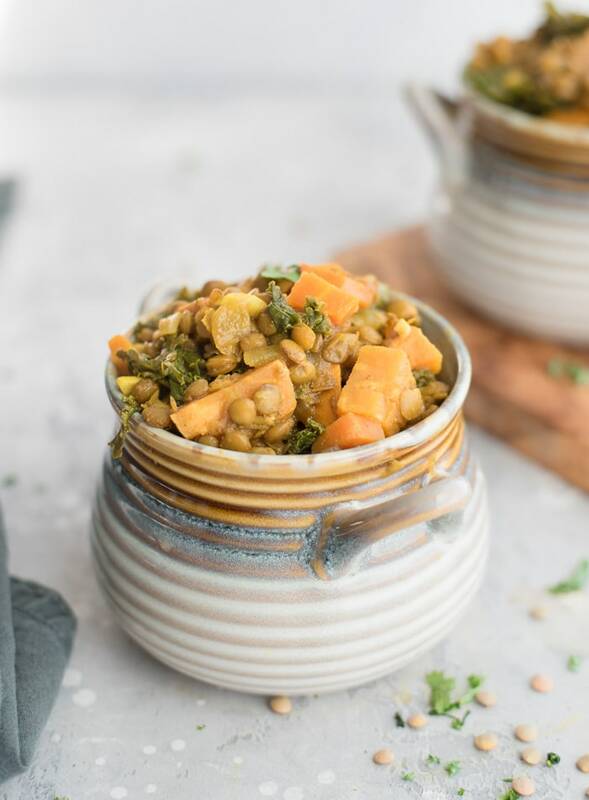 Lentils are an excellent source of cholesterol-lowering fibre and not only do they help lower cholesterol they can help manage blood sugar disorders since their high-fibre content prevents blood sugar spikes after eating. Lentils have also been linked to reduced risk of breast cancer when eaten regularly and are high in many essential nutrients such as protein and folic acid. This hearty vegan lentil sweet potato stew is one of my favourite recipes. It’s easy to make in one pot, ready in about 30 minutes and tastes amazing. 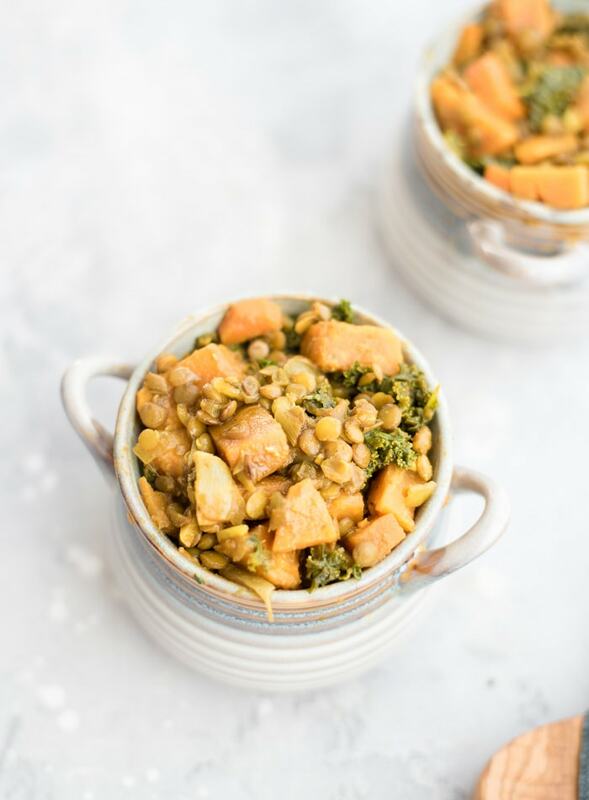 It has a curry base with fresh ginger, onion and garlic and the carrots, sweet potato, kale and lentils pack in the nutrition. The texture is perfectly creamy with delicious bites of sweet potato and carrot. This is a great recipe to make for food prep as the flavours only improve the next day. Try making a batch on Sundays so you’ve got cozy weeknight dinner ready to go! 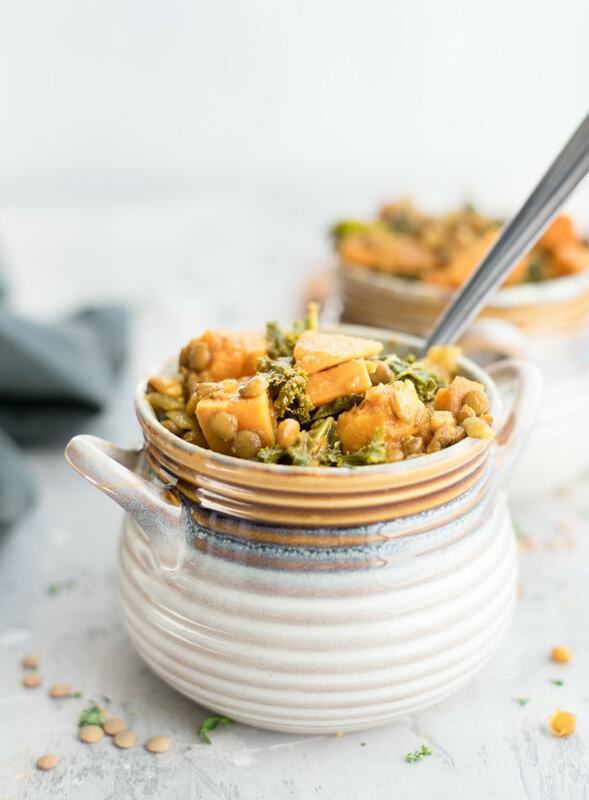 This recipe makes 5 servings that each provide 263 calories with 52 grams of carbohydrates, less than 1 grams of fat and 12 grams of plant-based protein. You’ll also be getting 15 grams of dietary fibre, tons of vitamin A, almost all of your daily vitamin and a good amount of calcium and iron. It also provides a range of essential minerals, has antioxidant and anti-inflammatory properties and is suitable for those with blood sugar disorders. This cozy dish is easy to make, full of flavour and the flavours only improve the next day so it can be made ahead of time no problem. Try it for a warming, filling dish on a cool Fall or Winter day. Cook the onion and garlic in a few tablespoons of water or broth 5 minutes in a large soup pot over medium heat. Add the curry powder, salt, ginger, tomato paste and cook a few more minutes, stirring. Add the lentils and broth, cover and simmer for 15-20 minutes. Add the carrots and sweet potato and simmer uncovered for 20 minutes or until the carrots and sweet potatoes are easily pierced with a fork. Stir in the kale, turn off the heat and let sit for a few minutes. If the lentils are soft and most of the liquid is absorbed, it’s ready! Yes, it’s spring, but we just got 4 inches of snow on Saturday! Stew is EXACTLY what I need! I’m 100% ready for spring and summer, but sadly, we are still dealing with winter-like weather! If you can believe this … my husband JUST tried lentil soup for the first time a couple of weeks ago. How is this possible?? I eat it all the time – and he sheepishly admitted he hadn’t ever tasted it. So we ordered it at one of our local restaurants, and he loved it! wow!! all my favorites in one! Yum! Just made this for and it is super relish! I have acid reflux and have to avoid tomatoes and onions. So i used onion powder instead and added a cup of mixed veggies to help bulk it up. Thank you for sharing! Wonderful!! So glad you enjoyed it 🙂 Thanks for letting me know! Thanks for this recipe, I made it last night and think it’s just perfect! It is just perfect, isn’t it? I love this dish 🙂 so yummy, flavourful and comforting. What type of lentils do you use? These are my favorite ingredients, making for our vegetarian potluck this evening. Thanks for he inspiration. This stew was absolutely perfect. I left out the salt and used low-sodium vegetable broth, and it was still incredibly flavorful, filling and delicious! Thanks for the recipe! This was absolutely DELICIOUS! Thank you so much for the recipe! I can’t wait to eat this again! This is comfort food at its best. I used coconut oil in place of olive oil and the tropical flavor came through nicely. This will become a staple in my house. Thanks so much Deryn. Yay! I’m so glad you liked it. Total comfort food. Thanks so much!! Thank you for this recipe! It was really delicious! My husband had a rare, aggressive cancer five years ago and we became vegan the day he received his diagnosis…he had 6 months to live and a vegan lifestyle has given him another chance at life!! A month ago we did a 60 day juice fast and are totally committed to maintaining our health. I am always searching for delicious recipes and this definitely caught my eye! I have added it to our culinary repertoire and we will enjoy it again & again! Thank you again Deryn! This dish is cooking away just now & so looking forward to enjoying it later……..my all time favourite stew especially in Autumn! This looks delicious! So hungry right now! The instructions on the back of the lentils I bought are completely different from yours–I’m supposed to boil them for 5 minutes, cover and let stand for 4-8, and then remove and drain. I’d love to make your recipe, but I’m not sure whose instructions I should be following. You actually want to use uncooked lentils in this recipe, so no need to use the instructions on the bag. Use 3/4 cup dry, uncooked lentils for this recipe, following the instructions as written. Enjoy! I’m not sure what happened, but the lentils came out mushy and the liquid didn’t really absorb. Ah, the joys of learning to cook! Any ideas what I might have done wrong? What kind of lentils did you use? Did you follow the recipe exactly? I used green sprouted lentils, and yes, I followed the recipe. Sprouted lentils have been pre-soaked so have a reduced cooking time and won’t absorb as much liquid as regular dry, uncooked lentils, so that’s probably what happened. If using sprouted, you’d probably need to reduce the cooking time and liquid quite a bit. 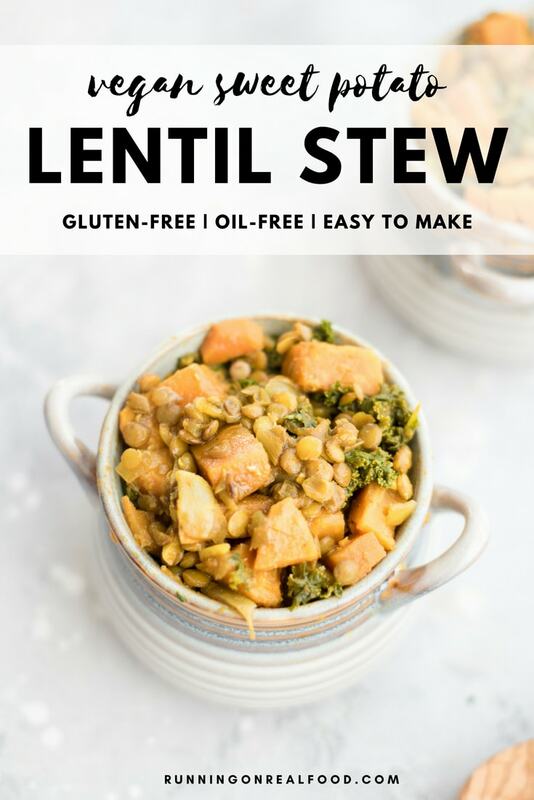 I would probably add everything but the lentils (using less broth), then when the potatoes and carrots is almost tender, add the lentils and cook until softened. I’m not exactly sure on the time and liquid adjustment for using sprouted lentils though since I’ve never made this recipe with them. Absolutely delicious, pretty darn easy and very nutritious!